It’s a broad term with plenty of interpretations. The content itself can include video, infographics, press releases, white papers, e-books, newsletters, case studies, podcasts, guidebooks, photographs, blogs … and the list goes on. Regardless of your content, content production needs a good partner: content planning. 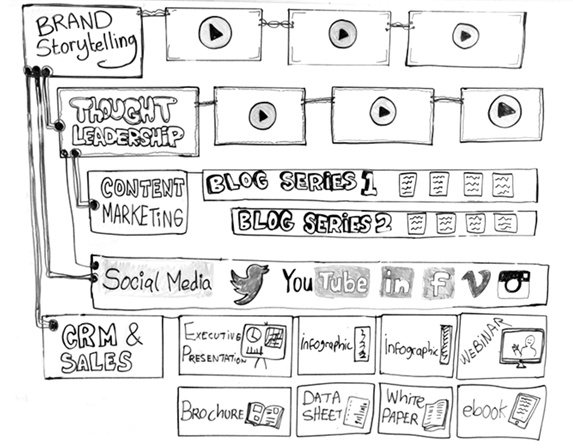 Take a look at the diagram we’ve drawn up and you’ll see how Big Red Oak approaches content planning, as it all maps up to brand storytelling. Big Red Oak is honoured to announce that the Digital Annual Report that we produced for Humber River Hospital has received a Platinum Award, the highest ranking in the 2018 MarCom Awards. ‘The Future of Care Today’ was acclaimed for its creative excellence in the Digital Media, E-Communication category. A truly great picture packs a powerful punch. Photography can convey so much: personality, setting, mood, time, message. This is the art form that inspires J.R. Clubb, who creates memorable cinematic portraits for our clients. J.R. developed his particular style from his affinity for fine arts and a sensitivity to his subjects. 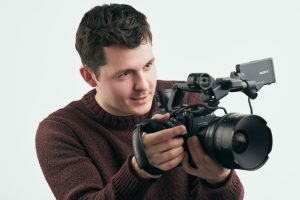 He understands the right mix of elements required for a successful shoot – location, vision, connectivity, timing – all enhanced with a touch of luck. Building relationships with people and seeing them in a new light has made J.R.’s career a rewarding experience. He takes his time to capture candid shots that he polishes through sophisticated post-production techniques. This short video illustrates J.R.’s approach and exposes the heart behind the art of his photography. Branding tells a lot about a business, and good branding can make all the difference to its success. The visual representation of a brand makes a critical first impression on its viewers, evoking a strong and intuitive response to the colour and design. It’s important to get it right. Big Red Oak counts on the creative talents of Lana McInnis to help our clients find or finesse a brand that makes a positive impact. She marries her passion for fine art and architecture, for fashion and trends, with her deep appreciation for commercial design. Lana truly enjoys working closely with people – learning about their individual inspiration and discovering what type of visual identity will speak most effectively to their audience. Meet Lana and hear her story in her own words in this short video. Big Red Oak tells our clients’ stories through creative media that reaches the right audience in the right way at the right time. Because people respond to different kinds of communication tools, we use video, audio, graphics, and written content to share these stories, produced by our professional team of writers, videographers, motion graphics artists, designers, and strategists. Our new series of videographic portraits illustrates what we do and how we do it. The first production profiles graphic designer Brad Sherri, highlighting his perspective on the impact of infographics. He explains how this combination of images and text conveys the message succinctly and powerfully to the viewer, with complex data organized in a style of visual shorthand that is easily digested and shared. Enjoy this short video, introducing Brad and his views on the work he loves.